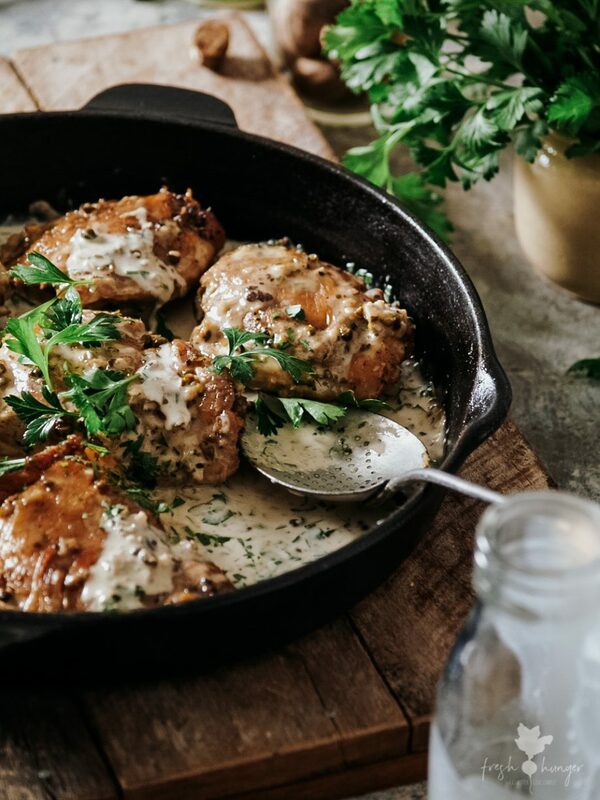 Creamy, dreamy, warming, rustic – whatever cliched, comfort food adjectives you can throw at it, this Easy Green Peppercorn Chicken will stand up to the overused accolades. 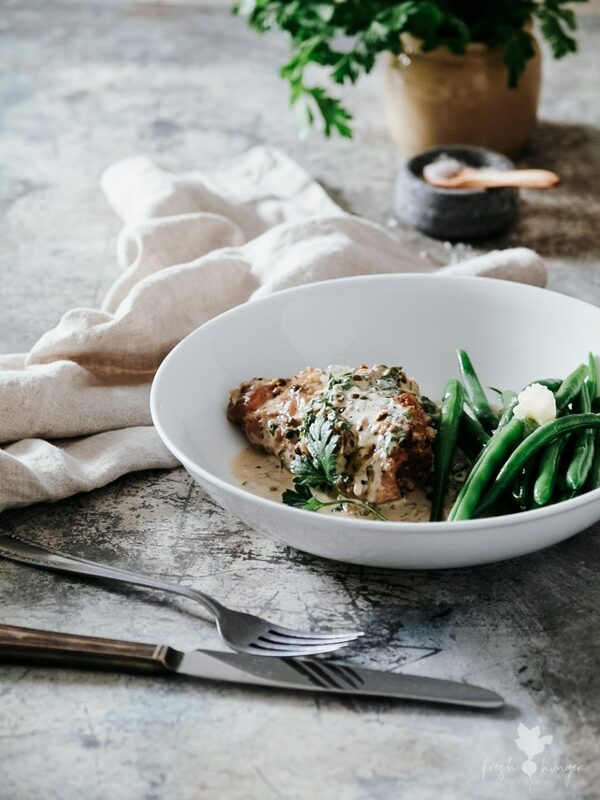 Serve it for a simple weeknight meal or joosh it up with some creamy mashed taters & steamed greens for a stress-free dinner party meal. Growing up, whenever green peppercorn sauce was served with steak or chicken in our home, well I knew it was a special occasion. 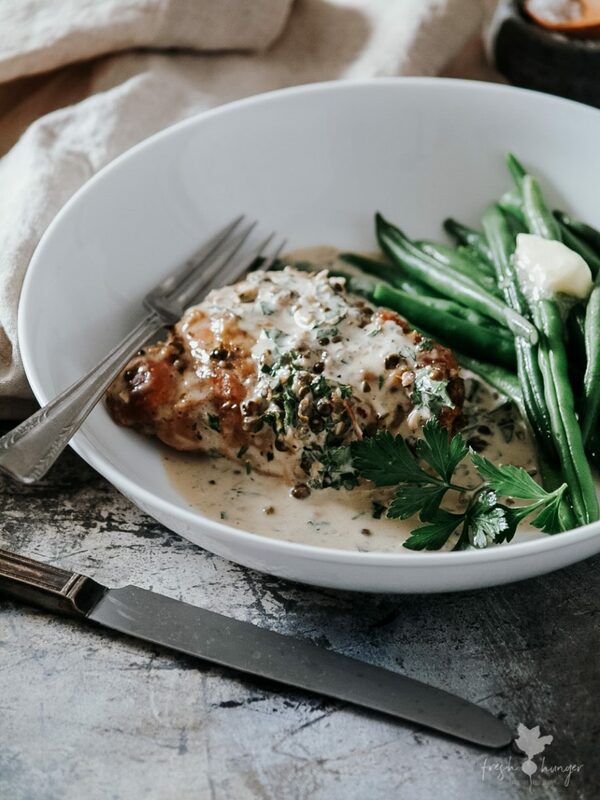 Whether it be for someone’s birthday, an anniversary or when mum & John threw one of their legendary dinner parties, green peppercorn sauce always seemed a little decadent, special. And I always loved it & still do. Now I make it to capture that feeling & do a little reminiscing. 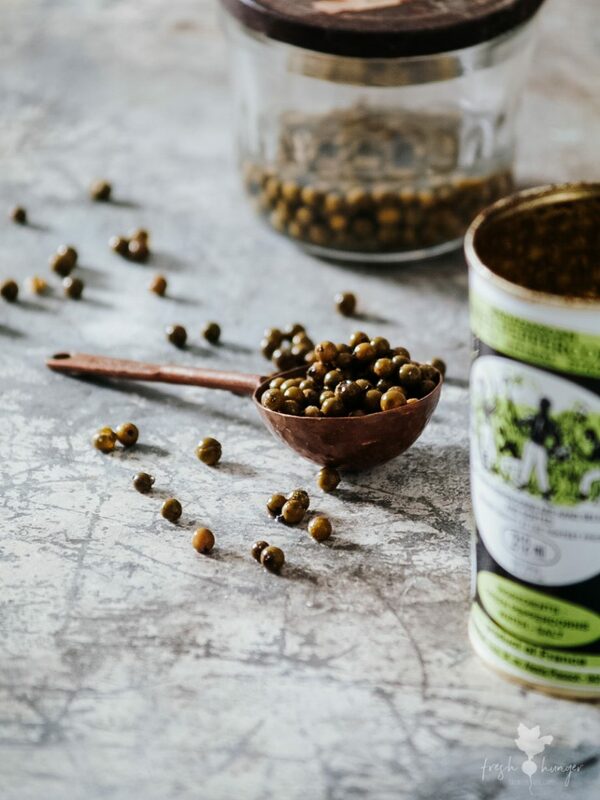 You’ll find green peppercorns in some supermarkets, Asian grocery stores, specialty food markets & online. Here’s a link for them on Amazon which is where I buy them. Once opened, store them in a jar with a screw-top lid in the fridge. They will keep for months. Add them to cream sauces to accompany steak, pork or chicken. They’re also an ingredient in some Thai recipes. There’s just a handful of ingredients in this recipe. Sherry, garlic & green peppercorns give the sauce its distinctive flavor. Cream adds the luscious mouthfeel we all love & the parsley adds an element of vibrancy. Switch the bone-in chicken thighs for whatever protein you fancy. Serve simply with steamed green beans & mashed or roasted potatoes. 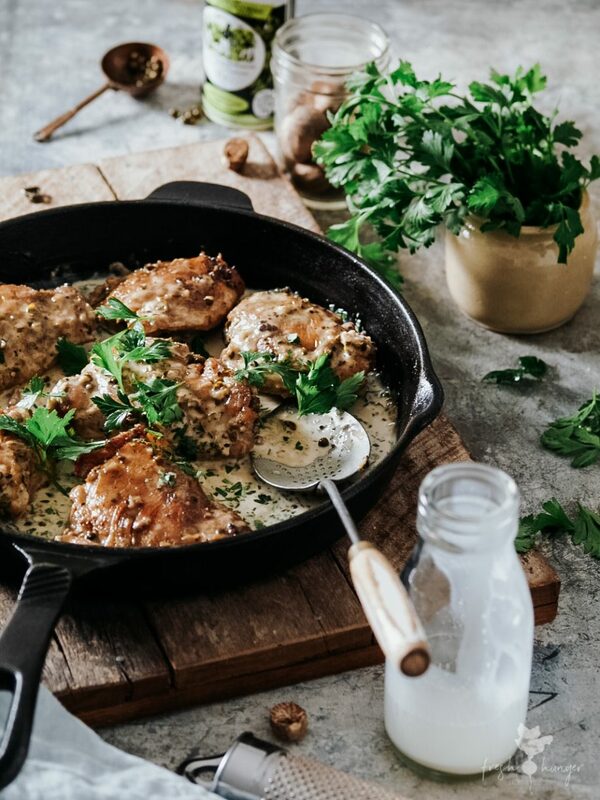 Chat to you soon, oh & if you’re looking for some other fabulous chicken recipes, here are three of the most popular on Fresh Hunger: Rustic Country Chicken with Olives & Potatoes, Bacon Wrapped Chicken & Broccoli Alfredo or The Best Roast Chicken. Pull-off & discard the skin from each piece of chicken. Heat oil in a large frying pan over medium-high heat. Brown chicken for 5 minutes each side or until golden brown. Remove chicken from pan. Reduce heat to medium. Add butter & garlic . Cook, stirring for 1 to 2 minutes or until garlic is fragrant. Add sherry. Bring to a boil. Boil, uncovered for 2 minutes to cook the alcohol flavor off a little. Add the green peppercorns & squish them slightly with the back of a large spoon. Add broth, salt, pepper & stir. Then return chicken to pan. Bring to a boil then reduce the heat to medium-low. Simmer, covered, turning the chicken occasionally & giving the sauce a stir, for 15 minutes. Add cream & parsley. Stir until hot or until sauce is thickened & chicken is cooked. Serves 4 to 6.